In 1978, physicist John Wheeler devised an experiment to test when light acts like a wave or a particle by changing the conditions of the experiment once it's already begun. Researchers have taken a famous quantum-physics experiment to new heights by sending light, in the form of photons, to space and back, demonstrating the dual-particle-wave nature of light over much greater distances than scientists can achieve on Earth. In the quantum theory of reality, particles like electrons and photons behave like waves as well, depending on how scientists measure them. 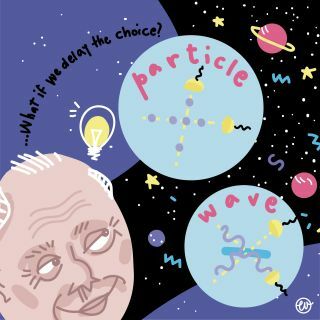 Physicists call this phenomenon wave-particle duality, and it leads to many counterintuitive effects, like single particles traveling along two paths simultaneously. In 1803, long before the conception of quantum theory, physicist Thomas Young conducted a famous experiment to demonstrate that light behaves like a wave. Young sent sunlight through two slits toward a blank paper card. When he observed the light on the card, it revealed a pattern of bright and dark bands that faded toward the edge. Rather than going through one slit or the other, the light had behaved like a wave, passing through both slits and interacting with itself to form a pattern, like ripples in a pond. The Italian team used this instrument, called an interferometer, to split and recombine light. Here it's seen with an alignment laser beam. In the 20th century, scientists placed detectors on such slits to determine which path the light actually took. When they did this, they always detected the photon in one slit or the other. What's more, the film developed two bright bands opposite the gaps instead of the ripples — the photons were going through one slit or the other instead of interacting like a wave. It's almost as if the light knew how the scientists wanted it to behave. Scientists were baffled as to how the light determined what to do and, more importantly, when it "decided" to behave as a particle or a wave. Does light commit to one behavior at the beginning of an experiment, when it's produced; at the end, when it's detected; or some time in between? In the late 1970s and early 1980s, theoretical physicist John Wheeler proposed some tests to answer this question. Some of these involved changing the experimental setup after the light had already entered the apparatus. This would delay when the light is able to choose its behavior until near the end of the test. It was one of Wheeler's delayed-choice experiments that the team at the University of Padova, in Italy, conducted and detailed Oct. 25 in the journal Science Advances. Wheeler's experiment had been done before, but not at this scale. Using a reflector on an orbiting satellite allowed the team to test the predictions of quantum theory over greater distances than ever before. "The law of quantum mechanics … should be valid for any distance, right?" Giuseppe Vallone, a researcher at the University of Padova and co-author of the study, told Space.com. "But of course, if we don't test it, we cannot be sure." The experimental apparatus on Earth sent out one photon at a time. That light was then split into two waves by a device called a beam splitter. The team sent one beam on a slightly longer path, so it ended up slightly behind its counterpart, Vallone explained. The key was that the scientists split the light in such a way that the earlier wave had horizontal polarization and the latter one had vertical polarization. In other words, the waves were oriented in two different directions. Then, the light beams were prepped and were ready to be sent to space. Vallone's team directed the light at a satellite, where a reflector sent it back toward the apparatus in Italy. At that point, two light waves were headed back toward Earth, one slightly ahead of the other. A beam of light (top left) is split in two and heads down separate paths. If the paths are recombined the two waves create an interference pattern. If not, a particle is detected along only one path. The actual experiment conducted by the Italian researchers started and ended on Earth, traveling to an orbiting satellite on the way. This is when the "delayed choice" part of the experiment came in. After the light was reflected, a computer sent a random signal to a liquid crystal. Depending on the signal, the device either swapped both light beams' polarizations, or left them the same. At that point, the light passed through the beam splitter again. If the polarizations were left unchanged, the splitter simply recombined the light, making it act as a single wave. If the polarizations were swapped, it separated them even more, creating a distinct delay between the two pulses so the light would act as an individual particle. The switch was decided only after the light was headed back to Earth, more than halfway through its 10-millisecond round-trip. This meant there was no way for the light to "know" what the scientists were expecting until the very end, when it hit the detector. If Vallone's group still saw the same behaviors — an interference pattern when the light was recombined, and single flashes when it wasn't — they would know that the light had been both a particle and a wave simultaneously, until their device made it choose one or the other at the very end. And that's exactly what happened. The light split into two beams, like a wave and, at the same time, stayed together as a single photon, until the end, when the liquid crystal device forced it to behave as one or the other right before hitting the detector. The predictions of quantum theory were vindicated, Vallone said — and the surreal nature of quantum mechanics was reaffirmed. Even though the Italian team's work focused on confirming previous experiments, the test was still worthwhile, according to Thomas Jennewein, a quantum physicist at the University of Waterloo, in Ontario, who is unaffiliated with the paper. The experiment Vallone's team conducted is closer to Wheeler's original proposal, Jennewein told Space.com, which relied on the distance the light traveled to keep it separated for a long time. "It is out in space, and it is far away, and so we are getting closer to the original scheme," Jennewein said. Wheeler's original thought experiment envisioned this test conducted on light from a distant galaxy, bent toward Earth along two possible paths by a massive object in between. In this situation, a single photon could have traveled along both paths simultaneously, only being forced to choose its behavior millions or billions of years after it began its journey. Vallone's group didn't replicate this aspect of the experiment, but they were able to keep the light in its bizarre double state, called a superposition, for 10 milliseconds — an impressively long amount of time compared to what was demonstrated in previous trials, according to Jennewein. The results of Wheeler's experiment can be unsettling for those who like to believe in a definitive, physical reality. The new findings suggest that the behavior of objects in the universe is fundamentally undetermined until something forces them to behave a certain way. Particles propagate like waves, waves coalesce into particles and nothing can be predicted with certainty, only a probability. Physicists often set these qualms aside to focus on their work. There's a saying, "Shut up and calculate," said Jennewein, who attributed it to Cornell University professor David Mermin. The idea is that scientists should work on figuring out the mathematics behind how quantum theory works rather than attempting to understand its implications. Neither Jennewein nor Vallone completely adhere to this mantra. "People spend lifetimes, almost, trying to get their heads around these questions," Jennewein said. "My personal belief is that we just cannot maintain our classical view when we look at quantum particles," he added. "It's kind of a new type of concept for us which has no representation in our everyday life." And our daily life is where we derive our intuitions from, he noted. Vallone approaches the concept in a similar manner. "When we think of a photon as a particle, as a little ball, we are [making a] mistake. When we think of a photon like a water wave, we are [also making] a mistake," he said. "The photon, in some cases, seems to behave like a wave or seems to behave like a particle. But actually, it's neither." Vallone's team used the Italian Space Agency's Matera Laser Ranging Observatory in Matera, Italy to send their light beam skyward. The experiment conducted by Vallone's team joins a new trend of space-based quantum research. In August 2016, China launched the first satellite designed specifically to test quantum theory and its applications in quantum computing. A team in Shanghai used the satellite to set a record for the farthest quantum teleportation, sending the state of one photon about 1,000 to 1,500 miles (1,600 to 2,400 kilometers) away. These feats may find applications in computing, according to Vallone. Quantum objects can be in two states at once, like the light in Vallone's experiment, so quatum computers can encode more information than traditional electronics, he said. Also, because quantum states change when they are observed, they promise greater security than conventional communication because you can tell that someone has tried to eavesdrop. Jennewein foresees more experiments like the one Vallone's group conducted. Space-based experiments enable researchers to explore the limits of quantum mechanics. "This experiment is a first step toward it," he said, and "I'm hoping to see more foundational quantum physics tests in space."